Everyone else is too busy tweeting about The X Factor. I’m sat here listening to the Black Keys and wondering how to waste the next two and a half hours. What I should be doing is sorting out the remaining things that need getting for Christmas or perhaps finishing all the half-finished efforts lurking in this room. I don’t want to though. I feel compelled to start something else instead. That’s just going to minimise what little space I have though, so that’s off the cards. I think I’m expecting something exciting to happen, not taking into account that it’s a Sunday and everyone is plumface knackered because it’s another Monday tomorrow. So… a pig on a hovering skateboard is not going to crash through the wall then. So… Mr Vinyl won’t enlist me to capture his MP3 enemies lurking on the Eastern sea board. Nope. It’s just me and piles and piles of stuff. Time for a clear out. At least in the morning there’s three parcels waiting across the road in the sandwich shop. A little excitement before the cold walk to work. So you think you’re safe do you? You think you can handle this harsh, load-bearing world do you? Think you’re up to the test? Most people in response to this question wouldn’t have been able to muster an answer; they would have fallen down onto their knees and cried into their lunch. Why they would be eating their lunch this late is anyone’s guess. The fact is that we all want to be tough and pretend to be tough but we’re not. What you need is someone watching your back and ding dang doodle noodle if that person isn’t yourself! Yes. You are the best person to leap to your defence when you run into some trouble. So what will you use? Anything with a point will be confiscated from you as soon as you try to leave your house. You need something a little more nondescript, something that will blend in. Food is a good start, but which? Swordfish is too obvious. Eggs will sting but won’t hold back those would-be should-be probably-are attackers. 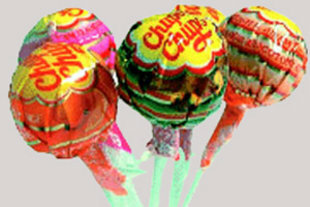 We start with the training wheels; Chupa Chups Lollies. Now I know what you’re thinking and yes, it is hard to cope with the stunning mix of looks and charm and wide legs. 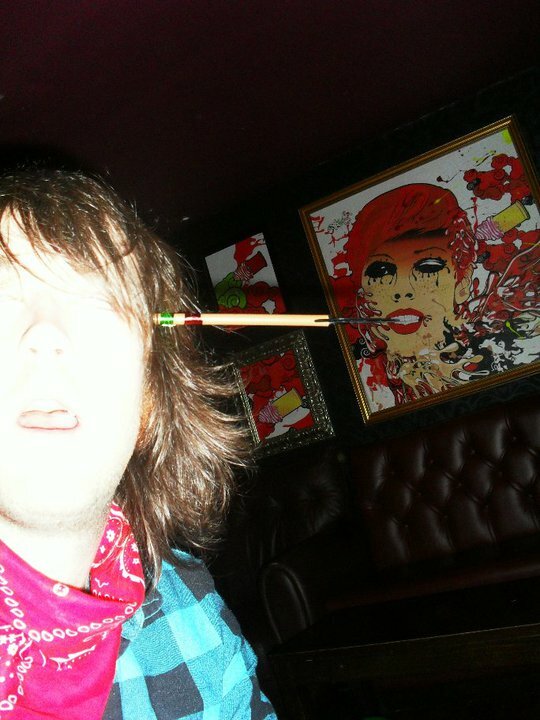 Lollies are a perfect weapon. 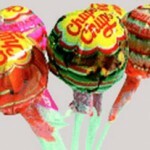 Take your hand and open the fingers then insert the round end of a Chupa Chups lolly between the fingers and close. Three instruments of pain are now yours to wield. Don’t bother using the stick ends because they’ll bend too easily. Smack someone in the face or arse or groin with those beauties and they won’t be getting up for breakfast. Clap your hands. Lesson one over. You know I haven’t really been here for a while. I think its twitter’s fault. Before twitter my random outpourings had nowhere to go but facebook, (and I’ve never really liked facebook. To me it was just the thing that filled the gap between myspace and what I now know to be twitter) so they ended up on here. Dont get me wrong, I’m by no means a prolific twitterer, but when i think of odd little things, they’re seldom worth more that 140 characters anyway. I’m not the sort of person who writes blogs. I’ve just not got much to write. I live a fairly mundane (but very happy) life, nobody wants to read about that, and even less people want to read about what I did with a stubborn server this afternoon. I’m not really sure where I’m going with this, but its the nearest thing to a blog post Ive written in a long time, so just… well… erm. Yeah. I know we complain about the lack of futuristic things and how disappointing the future has turned out to be, and quite frankly I don’t want to change that tide by swooping in and saying how great everything is and how content I am with how things are. Because I’m not. Far from it. 1. Robot Pants – not that I’m really so lazy that I don’t have the energy to remove them myself but I think some sort of crazy trousers would go down a treat. Imagine if they could heat you during winter months or blow cold air around when it’s hot. When you take them off they stand guard by your door or there could be a switch you can trigger to make loud noises when approached by elderly ladies conducting surveys, making them scurry away. 2. Gadget Gauntlets – one button could extend to reveal Spiderman-like stretchy goo stuff allowing you to climb tall buildings or harness criminals, another could reveal a tin opener or flares to distract would-be attackers. 3. Lasers – it’s an obvious one, and one which would of course be used by criminals for nefarious purposes. If they could develop one slightly stronger than a laser pen so I could use it to melt marshmallows instead of having to savage them with a cigarette lighter that would be a big help. Do you SEE where this is going? Nowhere, that’s where. Nowhere fast. Germany is not known for its love of cider. In fact, you are more likely to come across a dog with three legs rather than a pub or bar selling cider inside. Of course the country is known for beer and wine, so why would you go out of your way to try and find a drink that hasn’t been embraced? When you drink it most nights, that’s when. Bruno prefers cider to most other drinks. We did our very best to try and find some. We checked online at the nearby bars to see if they had it listed as a beveridge. We looked in supermarkets. It would appear that despite having a word for cider, ‘viez’, it doesn’t get used often. We went into a restaurant half a mile away and asked for a viez only to be greeted by confused looks by the staff. Bruno then using the international sign language for ‘apples’, ‘fermenting’ and ‘the internet’ tried to explain our endeavours. One of the bar staff went away and came back with a very dusty bottle which looked as though it had languished on some shelf for a couple of years. This was apfelwine, a sort of apple liquor / wine that was as popular as a slap across the chops. We made our excuses and left quickly. In the end, with some of Siobhan’s family travelling across Europe by car, they opted to asking them to stop off at a Tesco before leaving the UK to pick up a crate of Strongbow. Ironically by the time they arrived Bruno had gotten so drunk on vodka the previous night that he couldn’t even bear to eat let alone crack open a couple of cans. They remained practically untouched until I left. Our plane got into Frankfurt Hahn at 2pm on Wednesday morning. We picked up some shopping, including some very cheap Jagermeister (bad spelling) from a supermarket called Toom, and headed back. I then proceeded to drink a third of the bottle and woke up on Thursday feeling the burn. Later on after a day of physical activites which I mostly sat out for we went for a drink in one of the bars down the road. Where we were staying was in the bottom of this valley surrounded by many stunning views. We were dropped off at this grand-looking place over the river and went inside. Germany unfortunately has not really heard of cider much so Siobhan’s brother Bruno found it very hard trying to locate any with no concept of the language and their unwillingness to understand what “fermenting apples” really means. That’s another story. We sit down with some drinks and Bruno heads to the toilet. He returns a few minutes later. “Did you know which ones to go in?” I ask. “What do you mean?” says Bruno. “Well, did you know which was male and which was female?” asks Siobhan. “Damon means women you idiot!” laughs Siobhan. Today I have forgotten my Metro pass meaning that I cannot ride on either the Metro or the bus, which is a bit of an inconvenience seeing as I have to use both to pick up Reuben tonight. Therefore I am having to use my lunch break to haul my a*s home to pick it up and return to work within an hour. Can I do it? Only your Wheel Of Thrusting TM can tell you that. Last night within the space of two minutes I saw the trailer for not only Toy Story 3 but also the new A Team film coming out at the end of the month. As both a man and a manchild this made me happy beyond belief. Also to take the edge off the lunch-break-metro-journey-home-within-an-hour scenario I am looking upon it as an earlier insight into what post I may be getting today. And an adventure. Like that film ‘Nick Of Time’ but much better. It would appear that the camera, after taking semi-reasonable photos of me all day, decided that it didn’t want to do that anymore and that turning me into a weird monster was the way forward. I was too distracted by the music and my memory in its current state cannot remember the “point of ming” whereby I turned from being me into Captain No Face Many Chins. Needless to say I shall do my very best to ensure that this never happens again.